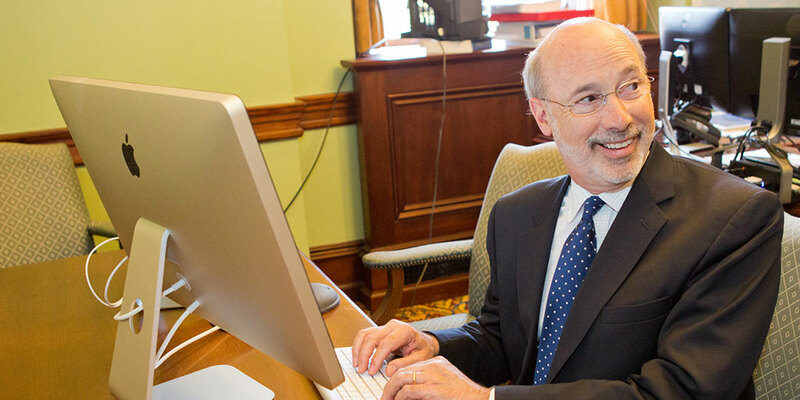 Harrisburg, PA – Governor Tom Wolf announced today that BrandYourself.com, Inc., an online reputation management company specializing in creating, monitoring, improving, and protecting an individual’s online presence, will expand operations and establish a site in the city of Lancaster, a business decision that will create 100 new full-time jobs with an estimated $5,000,000+ payroll. BrandYourself.com will expand operations by immediately leasing a 9,800-square-foot building in the city of Lancaster. The project will include leasehold improvements, the purchase of office furniture, computers, and software. The company plans to invest at least $900,000 on the project and has also committed to creating at least 100 new full-time jobs over the next three years. The company received a funding proposal from the Department of Community and Economic Development (DCED) including a $200,000 Pennsylvania First Program grant, $300,000 in Job Creation Tax Credits to be distributed upon creation of the new jobs, and a $45,000 WEDnetPA grant to train its workforce. Project support was coordinated by the Governor’s Action Team, an experienced group of economic development professionals who report directly to the Governor and work with businesses that are considering locating or expanding in Pennsylvania. This effort was undertaken in collaboration with the Lancaster City Alliance, the city of Lancaster, Economic Development Company of Lancaster County, and Oaktree Development. “It has been tremendously exciting to see how the Lancaster business community aggressively rallied around the opportunity to promote Lancaster as the best choice for BrandYourself’s expanded operations,” said Lancaster City Alliance’s President and CEO, Bob Shoemaker. Lancaster City Alliance, an economic development nonprofit supported by the private sector, focuses on economic development and quality of life strategies solely for the city of Lancaster. “Our City’s spirit of collaboration and thriving entrepreneurship helped the exceptional BrandYourself team see Lancaster as a natural fit,” added Marshall Snively, Lancaster City Alliance’s Executive Vice President and Chief Operating Officer and Executive Director of Lancaster’s Downtown Investment District. BrandYourself.com is both the first DIY platform and leading service provider to help anyone create, monitor, improve, and protect their reputation online. Since its launch in 2012, BrandYourself.com has been recognized by the White House, named a “Best Entrepreneurial Company in America” by Entrepreneur Magazine, declared “Best Online Reputation Services for Individuals” by Business News Daily and appeared on ABC’s Shark Tank, where they walked away from a $2 million offer – one of the highest offers in the show’s history. BrandYourself.com is now accepting resumes to fill positions for the Lancaster office’s opening in early spring of 2016. For further information on BrandYourself.com and to view available positions in Lancaster, visit brandyourself.com/info/about/jobs. For more information about the Governor’s Action Team or more about DCED visit www.newpa.com.